Measure the circumference of your Bust and Sternum Under Bust and select a size based on your measurements. ** For items with different torso lengths, measure from the top of your shoulder down to your Natural Waist (bottom of your rib cage). Developed in collaboration with relentless world-class endurance runner, Maggie Guterl, this lightweight, breathable, and race-ready hydration vest is designed specifically to fit the female form, and features a quick-sip soft flask hydration system. VaporMag 2.5L Women's Race Vest is rated 4.8 out of 5 by 9. Rated 4 out of 5 by Sakrid from Replacement bottles? Love the vest. Have had it for months. One of the bite valves on the water bottles has split. I can’t believe you can’t buy replacement bottles for these vests that are made with the extended straw. That seriously cuts the long term value. You have to buy another vest to get the bottles. Really?! Rated 5 out of 5 by Zuber from Super Lightwieght - Perfect Race Vest. Unbelievable- like your wearing nothing! Love the soft water bottles, with straw. Talk about "Hands Free drinking!" Actually found I drink more when wearing it, because its so easy !! Pockets are a plus, love the fact that I can pull my jacket thru the entire back bottom side to side pouch, and still have a zip pocket accessible. Plus have room in the between shoulder pocket. The sizing chart was spot on. I am 5'7' tall and 130 lbs and a Small fit me perfect. Amazing fit, no bounce, no chafing. If its a shorter run, I use one straw bottle and put my iphone in the other chest pocket, Fits great. Rated 4 out of 5 by Kate from Want better material I was looking for a small-capacity vest for medium-long rungs to replace my hip belt (which rides up uncomfortably and doesn't work as well for hydration). The capacity and pockets are perfect for me, and I love the bottle system with the straws (no leaking issues, easy to get in pockets, no sloshing, nice weight balance). However, I am looking for a vest I can wear with just a sports bra or running tank and this material was not as soft on the shoulders as the VaporHowe (which is what I was expecting). It is more mesh, I assume for better breathability, but it would have caused rubbing on a longer run. I will stick with my belt for now and see if the VaporHowe 4L will work next time it goes on sale. Rated 5 out of 5 by runrdes from Great lightweight Vest I've had the VaporMag for a few months now, and it has become my favorite vest. It fits perfectly, doesn't bounce, and has withstood daily abuse in the desert followed by spins in the washing machine. I've received compliments on the color as well. 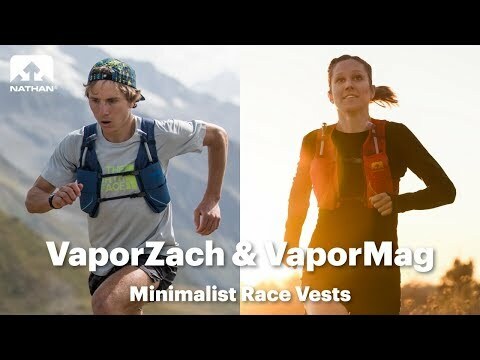 My only caveat is that given the small size it wouldn't be the right vest for long self-supported runs or races with long distance between aid stations. Rated 5 out of 5 by Norman K. from VaporMag 2.5L Women's Race Vest Love it! Finally, a hydration vest that isnâ€™t bulky, has plenty of room for all long-run necessities, and is very nicely fitted for a woman! Color isnâ€™t too shabby either! Rated 5 out of 5 by ashields107 from Great Pack! I bought this for my long runs and it is great! Lightweight and comfortable. No chafing so far! Barely notice that I'm wearing it. Rated 5 out of 5 by Andrea from Comfortable and great features This is very comfortable, easy access drinking straw and easy access to back pockets. Rated 5 out of 5 by Dana V. from Love it! So lightweight! I barely notice that I am wearing it.